Ireland’s First Peer to Peer Property Development marketplace, Propertybridges.com, looks to support new housing development in the Midlands and throughout the country. One way to help solve the housing crisis is to stop blaming each other; this organisation, that government body, those vested interests, these money men, bad planning etc and instead get behind small local developers, construction companies and groups of people looking to build new housing and come up with innovative ways to redevelop current sites! What if regular members of the public in the midlands with as little as 500 euro could help fund new housing developments in their community and at the same time make themselves a good and fair return on their money! Better than making ZERO on your savings with the bank! PropertyBridges.com, Ireland’s First Peer to Peer Property Development business is on a journey to bring all parties together! Launched in late 2018 and already successfull with it’s first two housing development projects, Property Bridges plans to sign up over 10,000 members of the general public this year to support smaller local developers and construction companies with the finance to build much needed new housing. Whether you’re a member of the public who would like to support these housing developments and make a good and fair return while doing it OR a small local developer or construction company looking for the finance to develop a housing project; check out the Website at www.propertybridges.com At the moment, Property Bridges is in the midlands area trying to meet with local developers, construction companies and members of the public in the hopes to get our first project in Meath, off the ground! The Irish public has over 100 Billion euros sitting in deposit and savings accounts doing nothing, making zero or next to zero return.!! At the same time we have a housing and property development crisis! What if we matched these two situations together and had a platform to allow them work together for a Win Win solution? Suitable for every person in Ireland with an interest in our struggling and under financed housing situation and with as little as 500 euro to spare..
PropertyBridges.com, Ireland’s new Peer To Peer property platform launched October, 2018. 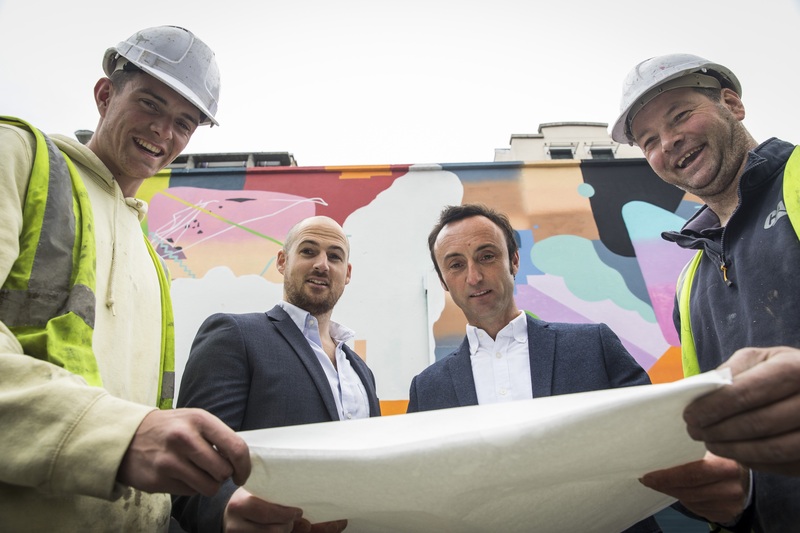 The platform will raise money for small developers, smal construction companies and private companies looking to develop housing and match them with thousands of lenders from the ordinary citizens of Ireland. This is people power at it’s best! This business is being run by David Jelly, Michael Fitzpatrick and Marc Rafferty as well as several experienced property analysts and due diligence experts behind the scenes. David Jelly has over ten years experience in the finance sector in London and Ireland, supported by Michael Fitzpatrick with fifteen years involvement in property development finance also in Dublin and London while Marc Rafferty was one of the founding team and original investors in Ireland’s biggest peer to peer business, linkedfinance.com as well as another well known business in Ireland, gocar.ie. ‘The peer to peer model is similar to what the credit unions are but with technology and transparency at it’s core. We realised at Linkedfinance.com that the peer to peer model allows regular people invest small amounts in their local SME businesses and make a good return on their investment while helping their community. Property Bridges will allow this same dynamic occur but this time in the property space and again for the public to fill the gap the banks have failed to do so adequately’. ‘On returning to Ireland after several years living in London working in the finance industry, I realised how the peer to peer model could be a fantastic benefit to the Irish property landscape. The old property industry was an exclusive club in which ordinary investors had little or no access to. With technology and the peer to peer model we can provide access and transparency to this once opaque market. With the help of the NDRC (National Digital Research Centre) and Enterprise Ireland, we have the technology, research, contacts and business model in place to be a disruptive platform in the sector. We can’t solve our current housing crisis in a click but we can help to alleviate the problem, project by project. Irish savers currently have 90 billion sitting in zero or low return deposit accounts. By investing in secure property loans, Irish savers can fund bright hard-working local property ‘not developers’ renovate, fit out, expand, finish off building projects etc. and actually see their money at work in local communities. Not to mention making returns of 8-10% on your investments while doing it. Globally there has been a huge shift to online investing but Ireland’s property market remains a traditional asset class that can be hard to access. We change that by allowing lenders to invest anywhere from as little as 500 euro to 100,000 in any one loan. Whether you are a person with some savings sitting idle in an account or a high net worth individual looking to diversify your portfolio, Property Bridges provides a high yielding, secure alternative investment. Remember, with Propertybridges.com, lenders can invest anywhere from as little as 500 euro to 100,000 in any one loan’! Bridge Peer Financial Ltd, trading as Property Bridges is a private company limited by shares. The company is based in Dublin, Ireland. To date the company has raised a €100k in investment from the NDRC and Enterprise Ireland (EI). These funds, along with cash investment from the promoters, has been used to support the development of the business to date.